Next week is Valentine’s Day! 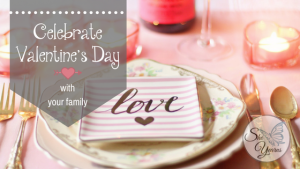 Most couples would prefer to spend Valentine’s Day as a romantic evening alone, but if you have children, that may not be an option. Some of us simply can’t afford both the night out as well as the cost of a sitter. Others may not be able to find a sitter AT ALL due to the demand generated on this one evening. Or, maybe you have ventured out in previous years, like we have, only to waste the majority of the evening waiting on dinner at a restaurant (not my man’s idea of a great time :/). Let’s face it, the options for spending that romantic night alone on Valentine’s Day, are slim at best. That is why we began opting to wait for a date night on a weekend somewhere around the special day, and instead, introduced a tradition that involves the whole family. For the past several years, we have utilized the Valentines Day evening as a training ground for etiquette and manners. But not only for introducing what is prim and proper. We use the time to focus on each child individually — what we see God doing in their lives or how we see them growing in character. I prepare the dining room table with the “good dishes.” Everyone helps set the table with place settings you might find at an expensive restaurant, complete with salad and dessert forks, as well as goblets for drinking water. (Well, if you consider Wal-Mart $1 goblets expensive and my glass dishes from Ross “expensive.” We’re still talking about twin ten-year-old boys here. The heirloom China will have to wait a decade.) I make a “fancy” dessert but we order the meal from a restaurant that provides take-out, like Chili’s or Applebees. Everyone changes out of their school and work clothes for something a little nicer, and we create ambiance with music and candles, perfect for sitting down to a most memorable evening. At this point, my girls are willing to clear their schedules to be home for this event. It makes them feel elegant while preparing them for events that might come there way in the future. The boys simply must endure the napkins and extra rules to partake in the dessert. And as an added bonus, I generally include a little $2-type gift for each one at a discount store — just for fun. They have grown to look forward to this, too. What can I say? My crew is low maintenance. With the ambiance set, during the course of the meal, Chad and I take turns expressing to each of them how much we love them, and specifically, what characteristics we see blossoming in them. They will have to endure this type of exchange between the father and myself, as well. According to research, the best gift we can give our kids is parents secure in their marriage. They need to see it lived out in front of them — even if their current response is, “Ewwwwe!” coupled with giggling and uncomfortable shifting. All this hoopla may be more than you desire for a weekday. I understand. The point is to find ways to capitalize on the time God has blessed us with…together. Instead of being saddened by missing out on all the fun or just not doing anything because you can’t find or afford a sitter, try something else that redeems the time and the intention of the holiday. Seize the occasion to make those you love aware of how much they mean to you. Keep it simple. Make it lavish. Whatever you choose, ensure it is effective. Most likely, everyone will enjoy it so much, they will want to do it again. And again. And again. May your Valentine’s be filled with love and laughter together.